Heatstroke or Sunstroke (Serious). Symptoms include hot, flushed skin with high fever over 105° F (40.5° C). A rectal temperature is more accurate than an oral temperature in these cases. 50% of children with heatstroke do not sweat. 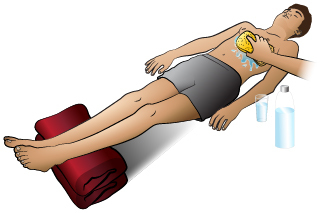 Heatstroke can cause confusion, coma or shock. Heatstroke is a life-threatening emergency. It has a high death rate if not treated promptly. Heat Exhaustion. Symptoms include pale skin, profuse sweating and nausea. Dizziness, fainting, or weakness can also be signs. Can have a mild fever 100 - 102° F (37.8 - 39° C) for a short time. Most of the time, there is no fever. Most of these symptoms are caused by dehydration from sweating. A person can progress from heat exhaustion to heatstroke. So, all patients with severe symptoms (such as fainting) need to be seen now. Mild symptoms (such as dizziness) can be treated at home with fluids and rest. But, if these don't resolve with treatment, these children also need to be seen. Heat Cramps. Severe muscle cramps in the legs (calf or thigh muscles) and stomach are present. No fever. Tightness or spasms of the hands may occur. After your child drinks fluids and cools down, he or she will feel better. All symptoms should go away in a few hours. A hot humid climate can also add risk if you aren't used to it. This happens on vacations. The first heat wave of the summer can cause similar problems. It takes 8 to 10 days for you to become used to high summer temperatures. All the symptoms of heat reactions respond to fluid replacement. Type of Fluid. Give your child as much cold water as he will drink. Do this until he feels better. If you have a sports drink (such as Gatorade), give it instead. Sports drinks contain water, salt and sugar. How Much (Teens). Start with 3 cups (24 ounces or 720 mL). Then give 1 cup (240 mL) every 15 minutes for the next 1-2 hours. Preteens (6-12). Start with 2 cups (16 ounces or 480 mL). Then give 6 ounces (180 mL) every 15 minutes for the next 1-2 hours. Urine Color. The urine color can tell you if drinking enough fluids. Dark yellow urine means mild dehydration. Clear or light yellow urine means your child is drinking enough fluids. Heat cramps are the most common reaction to heat exposure. They are never serious. Sometimes, they can be an early warning sign of heat exhaustion. Heat cramps should clear in 1 to 2 hours after lost fluids are replaced. Weakness should clear in 2 to 3 hours after lost fluids are replaced. The body can become overheated from activity when it's hot outdoors. The temperature should come down to normal after drinking fluids and resting. This may take 1 or 2 hours. Fluids: First, have your child drink some liquids. Cool Bath: Second, take a cool bath or shower for 5 minutes. Reason: Brings down the temperature faster. Don't give salt tablets. Reason: They slow down the absorption of water and may cause vomiting. Have your child take water breaks every 15 minutes in the shade. Have him drink some water even if he's not thirsty. Thirst can be delayed until a person is almost dehydrated. Sports coaches suggest that exercise sessions be shortened and made easier when it's hot. This is usually when the temperature is over 82°F (28°C). Also, this is very important if the humidity is high. When using a hot tub, limit use to 15 minutes. Use a "buddy" system in case a heat reaction suddenly occurs.